Injuries are the leading cause of death among young people under the age of 44 and most injuries are preventable (CDC). Providers at the HSU Student Health Center can diagnose and treat various injuries such as cuts, bruises, sprains/strains, broken bones, and head injuries. 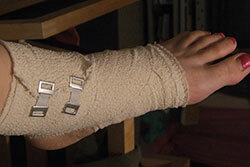 Complex injuries will be referred to an appropriate specialist. We have a Physical Therapist who is available on a limited consultation basis by referral from the Student Health Center. Depending on insurance, referrals can be made to local Physical Therapists. • Always wear a seat belt in a moving vehicle. • Always wear a helmet when riding a bike, skate board, or skates. Use other protective gear, such as wrist, knee, and elbow guards. • Never drive or let others drive after using alcohol or other drugs. • Don’t drive while distracted (don’t text or talk on the phone). The North Coast Concussion Program at HSU is a resource for concussion information, management, and prevention.